Dual Gauge Shotshell Case. The S25D holds 25 shotshells in the down position. The removable tray is for 20 gauge and can discarded. With the tray out, the box it will hold up to 3" 12 and 16 gauge shells. 2 ¾" fired shells fit back in the box, important, if you're reloading. The latch has been designed to be opened easily, even with gloves. Available in clear smoke or forest green and has a mechanical hinge. 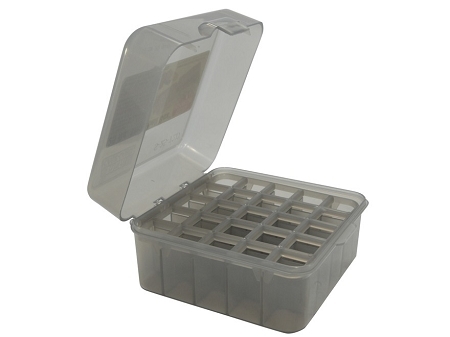 Can also be used to organize some brands of 28, 20, and 12 gauge Choke Tubes with a maximum lenght of 2.7".